Until now! Introducing the latest Organized Christmas forms set: Christmas Pocket Planner Forms! They're simple, fresh, and free: printable Christmas lists and holiday planners from MintPrintable.com. Brightened up with colorful clip art, this selection of Christmas gift lists, Christmas card list, to-do lists and Christmas wish lists is free for the printing! If you're making a Christmas pocket planner to use--or to give--this year, take note of the Christmas to-do list. Offered four to a page, it's right-sized for a planner pocket. Love all things "prim"? Our friend Melinda does--and her Christmas notebook tour shares several cute, country printable cover pages for your Christmas planner. An organized touch: download your favorite printable Christmas planner cover page for 2008, 2009, or 2010. This thoughtful addition makes it easy to create Christmas planner notebooks to give as gifts this year. Shared with a sister or a friend, you'll get ready for Christmas, 2009, together! Thanks, Melinda ... nice work! It's a planning calendar and gifts-to-make list in one: a handmade gift planner/2008 calendar combo from craft blogger Cindy from SkipToMyLou! Use this free printable form to set deadlines for handmade gifts and record ongoing projects. It's a great addition to your Christmas planner! While you're there, don't miss Cindy's creative ideas for handmade holiday gifts. She's covered a full range of easy to make, easy to give ideas for holiday projects. Get inspired! Pretty, shmitty: you want holiday planner forms without all the colored ink and graphic foo-foo? 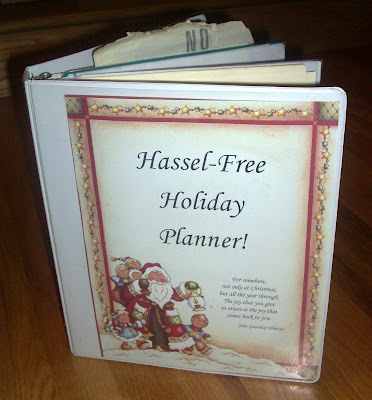 Here you go: a set of six basic holiday planning forms from D*I*Y Planner reader shris. Downsized and created in greyscale, these printables will appeal to folks looking for a no-nonsense, downscaled Christmas planner. A bonus: included source files allow users of Open Office to edit these planner pages.